Product code: MM0329 Categories: Accessories, Accessories. Keep warm this winter with these luxurious possum merino gloves with technology on the first two fingers & thumb allowing use of touchscreen devices without having to take your gloves off! Please note that these gloves come up generously and please do not hesitate to contact us if you have any queries. These possum merino touchscreen gloves have touchscreen technology at the first three fingertips allowing for easy use of you smart phone whilst keeping warm. 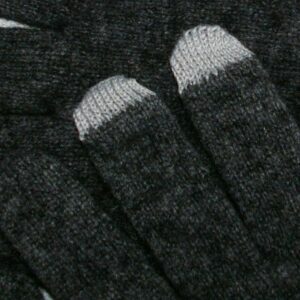 These gloves are made from a blend of 40% possum fur, 50% merino wool and 10% silk and thus are exceptionally warm. 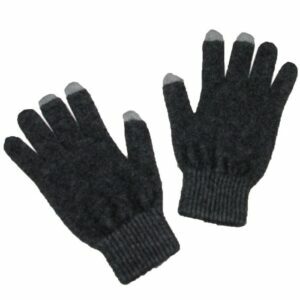 These gloves will also resist pilling and are very durable as well as being light-weight and very comfortable. These possum merino gloves are available in Slate and are unisex with sizes Small, Medium and Large.